Back Link building is the process of creating niche, location and authority relevant links on other high domain authoritative, trustworthy websites (such as The Huffington Post), so that they point back directly to your website with the goal of increasing its rankings by developing and growing the authority of that particular site. Before Google and other search engines rank your website, it will first take a look of how frequently other websites are linking back to your site and how relevant those websites are in their eyes. Although these factors are known as off-page factors, they are equally as important as the on-page factors. This step is essential to getting high organic search engine rankings. The more websites that link back to your website, the higher your website ranks on search engines. But it all depends on the ”quality” of those links and the ”relevancy” of those links. They should have niche and location relevancy. And the DA (domain authority) of where the links come from is crucial. We do not want or need spammy, crappy or scammy low DA quality backlinks. This will hurt you for sure. And we’re sure that isn’t something you would want for your presence online. Having no other websites mention or talk about yours is like the lonely high school kid that has no friends. This is why it’s crucial that you master the process of building high-quality links. If you can frequently have other external websites to link to yours it can truly result in you having an uncompetitive advantage over your competition. Besides from the fact that link building helps improve your SEO ranking, it also improve your behind the scenes reputation on the internet. You see search engines are constantly on the hunt for websites that are high quality, important, and that are authoritative. And the only way your website can demonstrate those qualities is by how often other sites, and how important/authoritative those websites are to, link back to yours. Here’s one thing that might surprise you. You can have lots of valuable and high-quality content, but if people don’t link to you, search engines won’t recognize your website as important. Search engines care more about link-building rather than how valuable your website is. In reality they only see through links. 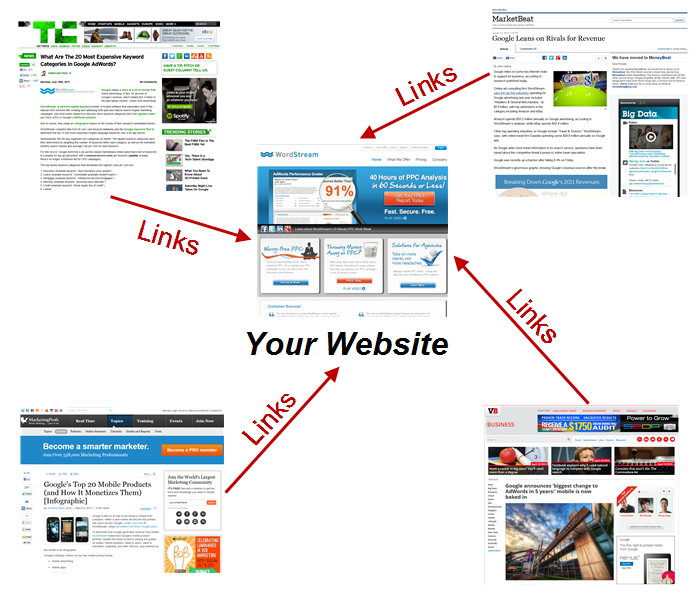 And links are what captures search engines attention the most. If your competitors only have 3 websites back-linking to them, search engines won’t see you as important and therefore will rank you at a lower search ranking. On the other hand if you have 5 websites back-linking to you, search engines will see you as having a better reputation and therefore will rank you higher. This will then make it easier for potential customers to find your website and click on it, driving more clients and traffic to you. And that’s it! All you just did was simply have your website back-linked with other popular websites and it increased your search engine ranking. Not just that, but you’ve gained greater popularity and a stronger web presence by having other websites talk about yours! By focusing on all these, We’ll be able to craft for you an in-depth and specialized link building strategy that will get your website to the top of Google!